Cycle it, walk it, run it ride it! We launched a free treasure hunt on Saturday 6 July 2013 as part of the Hayling Billy 50 commemoration. It is based around the route of the Hayling Billy line between Havant Station and the HIADS Station Theatre – which used to be the station at the end of the line. You can cycle, walk, ride or run the treasure hunt in either direction. You can download the treasure hunt from here, so you can use it when and as many times as you like. Click any of the links below for more detail. We’re sorry, but the deadline for prize-giving has passed. Feel free to use the treasure hunt anyway. By bike, via the Billy Trail which is part of national cycle route 2, and the Shipwrights way. You can also bring bikes across from Portsmouth on the Hayling ferry. By bus – routes 30 and 31 pass the end of the Billy Trail; the nearest stop is in Station Road, West Town. By car – there are public car parks at: the end of the Billy Trail, in West Town and on the sea front. If you are not cycling the route, the easiest way back is by 30/31 bus that runs between Havant Bus Station and the South end of the Billy Trail. Route 31 is the shortest going south to north, and route 30 is the shortest going north to south. On the sign board at the south end of the trail, what is the price of the cheapest ticket from North Hayling? Who is the bench opposite a gate dedicated to? According to the interpretation board, what is Seagrass also known as? One of several pill boxes built to defend Hayling Island during World War 2. How many gun slits are there? According to the interpretation board to the north of the pill box, what is rumoured to have been smuggled through Langstone Harbour? According to the interpretation board, what wild flowers should we be looking for? According to Natural England and the Safer Havant Partnership, what is the special nature of the oyster beds? According to the interpretation board, what common bird of prey can be seen here? 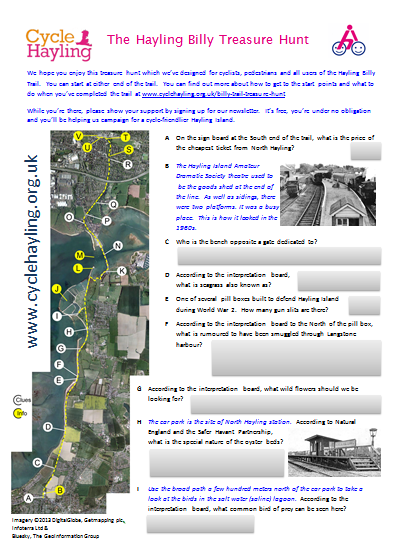 Admire the Cycle Hayling map! Which company created it for us? How many blue lamp posts on this side? How far is it to Emsworth on the Wayfarer’s Walk? At the east side junction with the main road, who helped erect the notice board? On the bridge across the stream, what are the two colours of the footpath sign? At the north end, according to the stickers on the shared footpath sign, what two major routes are we using? Please don’t forget to register your support for Cycle Hayling.